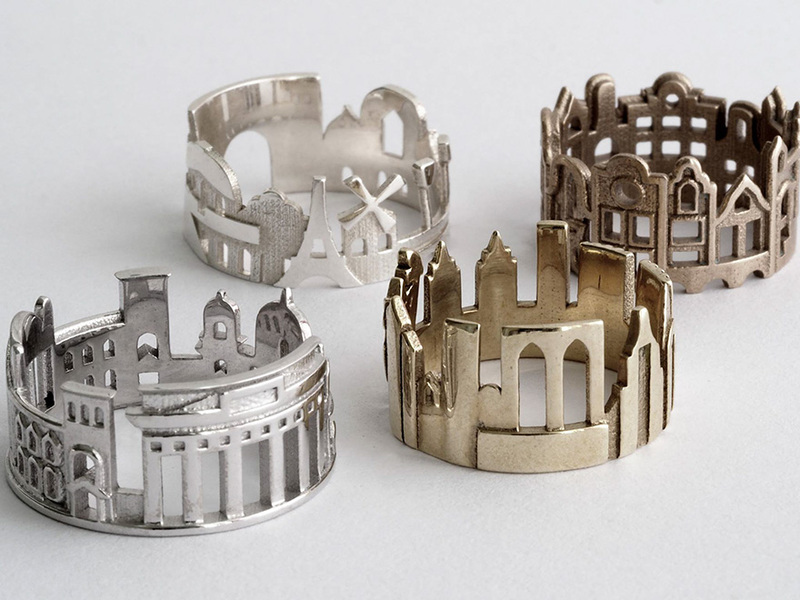 Ola Shekhtman, a Serbian goldsmith trained in St. Petersburg, makes rings of iconic cityscapes. 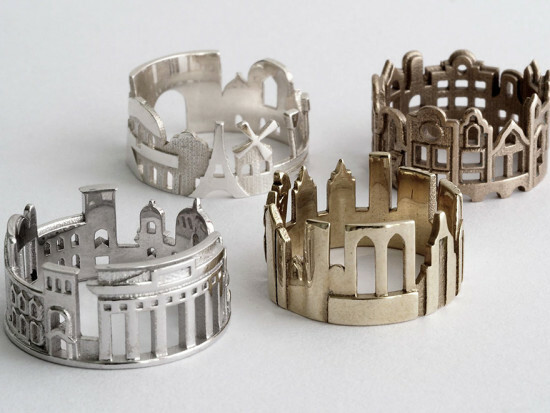 Shekhtman forms the rings by hand, melting, rolling, sawing, and soldering the metal into architectural figures from renown cities. Her collection includes London, Paris, New York, Berlin, Washington D.C., Charleston, Boston, Hong Kong, San Francisco, Amsterdam, Stockholm, and Edinburgh. The Serbian goldsmith developed her craft in 2011, studying in jewelry school in St. Petersburg, Russia and has moved to a different city each year. Her constant departure from cities inspired her collection. “Do you buy a single cup of coffee and sit at a Starbucks for an insane amount of time daydreaming of Paris? Do you miss London when none of your friends want to grab a pint on a Tuesday? Do you yearn for New York when you smell the faint scent of urine first thing in the morning? 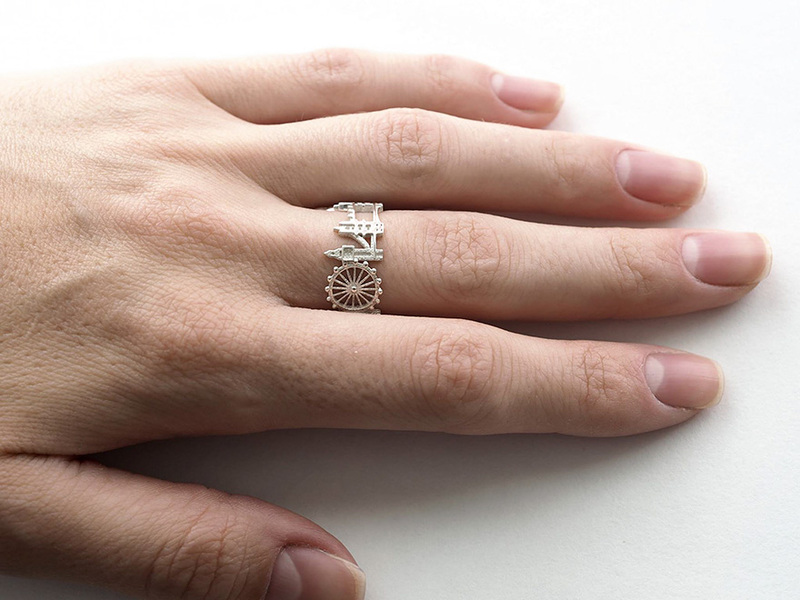 Here’s something that’ll make you light up like a city skyline at night,” said the Huffington Post on Shekhtman’s cityscape rings. 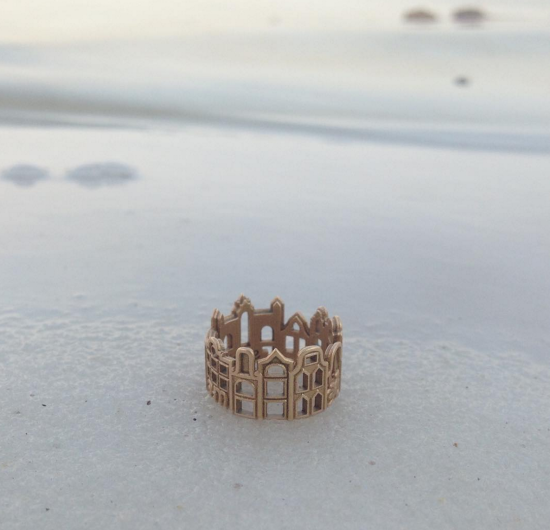 The Serbian goldsmith’s Instagram page exhibits her rings accompanying her on her various travels. “Amsterdam says Shalom from the bay of the DeadSea, Israel,” Shekhtman captioned the image above on Instagram. Seattle and Chicago are Shekhtman’s most common requests and should be the next cityscapes added to her collection. For more information on Ola Shekhtman’s handcrafted cityscape rings, check out her Etsy page here.